Hi, I am interested in your 1964 Chevrolet Corvette (stock #5085-CHA) listed on Autotrader for $63,995. I'd like to get more information about this vehicle and confirm its availability. When going classic Corvette shopping, the first thing you look for is originality. 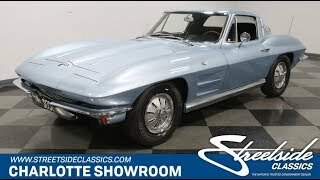 So youll be happy to read that this 1964 Chevrolet Corvette Sting Ray coupe that caught your eye with its beautiful paint is also a numbers-matching, four-speed car that was restored to keep its factory specs inside and out. Silver Blue is a great color on a collector Corvette. It was only offered for two years on the C2, and it has a terrific look of an ocean wave with precious metal undertones. It also helps that this was given a thorough restoration that gives this special color a deep gloss and shine. In fact, when the sunlight hits it, youll love how the finish highlights the crisp details that makes this Sting Ray coupe legendary. Plus, this silver undertones are a nice complement to the brightwork pieces like the rocker panel as well as the two-piece front and rear bumpers. And as youre looking over all the details, you can tell they kept this one with an eye for originality, right down to the wheel covers. Its hard to attract more attention in the interior of a light blue car than with a dark blue interior. This festival of blue looks great thanks to the carpets, door panels, and dashboard all looking exceptionally clean. But as the driver, youll really enjoy the well-maintained bucket seats. Your left hand grabs the three-spoke wood rim sports steering wheel, and beyond that is the full gauge set with large speedometer and very useful tachometer. But your right hand gets the real treat. The four-speed manual transmission was the correct choice for your Corvette if you love to drive. Plus, theres just something cool about grabbing the big chrome leaver housed in the original chrome console. And just like the exterior, the period-correct feeling goes right down to the details, like the AM/FM stereo. Lift the hood, and youll find a beautifully honest 327 cubic-inch V8. This is the numbers-matching unit of the Sting Rays upgraded L76 motor. Topped with a four-barrel carburetor, this was built for higher compression and higher lift camshaft, and it was rated from the factory at 365 horsepower. On the road, this motor has the right amount of snarl through the dual exhaust pipes, and the control of the original four-speed really lets you experience this to the fullest. Its the kind experience thats perfect for a little Saturday night intimidation, but it never gets old when spending all-day Sunday driving the backroads. This great driving attitude is backed up by power brakes and the fully-independent front suspension. Complete with owners manual, this is the distinguished and speedy classic that sticks to its iconic looks. It makes for a truly desirable Corvette that you can take home today. Call now!